In the Iowa House chamber, there were 58 speakers today, 32 in favor and 28 against House File 2420 . Almost every speaker in favor of the bill had little more to say than “everyone benefits, so everyone should pay”. Not much explanation why someone who does not want to be represented by a union has to pay the union, and why people should be forced to pay to have a job. There was some attempt to explain why unions shouldn’t just drop representing non-members. If I had to sit and listen to just all of the speakers in favor of the bill, I probably would have fallen asleep by the time it was half over due to the redundancy. Mind you, I’m glad that all of those speakers took the time to come and speak, but the argument is pretty simple and not compelling (at least not to me). One union leader admitted that the ultimate goal is repeal of Right to Work even though such a repeal doesn’t “resonate with Iowans”. Another supporter (John Neiderbach) said: “Read the bill. This is a very modest bill.” As if partly bad isn’t a problem. Interesting were the number of people who opposed the bill that one would have expected to be in support of it. At least one democrat who is a business owner, one educator, and a retire union member. (I am not sure of the name of the speaker) Many companies looking to come to Iowa will not due to this very bill because they will not even take the time to look at the code and understand that the bill only impacts the public sector (and only the Iowa State Executive Branch of Government). 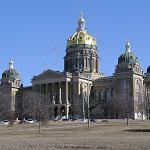 Jason White later said that the bill has a “detrimental effect on Iowa business development”. Also explained that companies react even to the discussions of these bills. Heather Stancil made a case for the bill being unconstitutional. Matt Sexton (Iowa College Republicans) said that Democratic leaders are working against the will of the people of Iowa. Dimitri Kesari (National Right To Work Committee) stated what was also tweeted earlier by Representative Nick Wagner: Unions negotiated their way into sole representation of all employees. My biggest whine about tonight is that I had to listen to so many people refer to this as a “Small Fee”. This is a $5.3 Million windfall for labor unions, money essentially promised to the unions by Democrats. That’s the driver behind this, not fairness. There is no legislative mandate for unions to represent everyone, and I agree that perhaps there could be multiple unions competing for employees. It’s a farce to think that unions are “stuck” representing non-members, and it’s just not right that anyone would be required to pay for the opportunity to have a job. But most importantly, we will undoubtedly hamper economic development, JOB development, by passing this bill. Jason Clayworth captured several more sets of comments here .